Mankind has been fascinated by spice since we first tasted the hot pepper -- it's spurred the colonization of entire continents, generated millions in international trade markets, and, perhaps most critically, merited rankings of the best hot sauces ever. 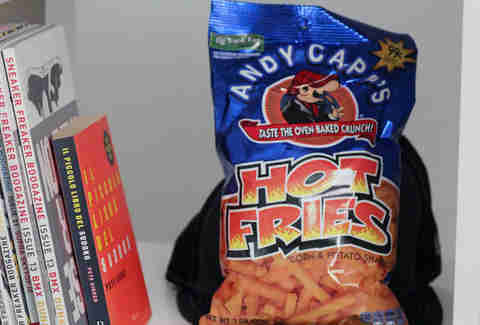 And since reaching for a spicy snack is the easiest way to get your fix, we put together a panel of spicy savants and had them rank a bunch of popular hot snacks based on taste and heat level. Rankings were done on a scale from 1 to 9, where 9 stands for tasty and spicy. Prepare to get fired up in a figurative and somewhat literal sense. Average taste ranking: 4 - With a not-quite-placeable flavor that our tasters described as being like pizza, chicken nuggets, or a taco shell after all the fillings had fallen out, there was one thing everyone could agree on -- it was entirely too subtle. Average spiciness ranking: 2.3 - Even though they’re billed as “red hot”, these Mojos packed less punch than Austin Powers straight out of his cryogenic freezer. Overall: If you’re looking for some real mojo, go with a jojo. Average taste ranking: 3.7 - Like a sour cream & onion chip’s spicier cousin, the flavor profile has hints of garlic and an undertone of jalapeño. 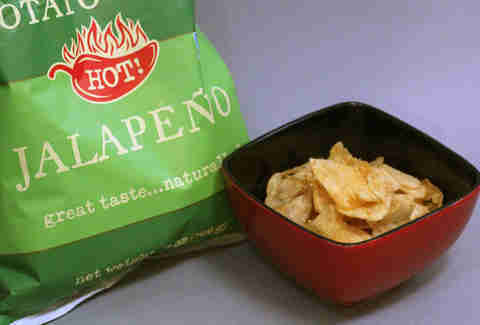 But with jalapeño in the name, you’d have thought they’d go for the gusto on this one. Average spiciness ranking: 2.7 - Not really hot enough to leave a lasting impression, but the tasters did agree that the spice in this one tasted more natural than the rest. Overall: Good for a party, maybe, but certainly not getting jalapeño business. Average taste ranking: 4 - Smoky and corn-y (like your creepy Uncle Jeff), these guys smell like chili and even have a chili flavor up front, but it quickly fades to just plain corn. Average spiciness ranking: 4 - Very middling. The spiciness hits with moderate strength right away, but doesn’t leave you with any lingering sensation. Overall: Red hot? Perhaps not. Blues? Definitely. Average taste ranking: 4 - Almost all agreed that the taste was satisfactory, and yet suspiciously similar to regular Nacho Cheese Doritos. Average spiciness ranking: 5.2 - Not overwhelmingly spicy, but there certainly was a hint of vague nacho-y chili in there. 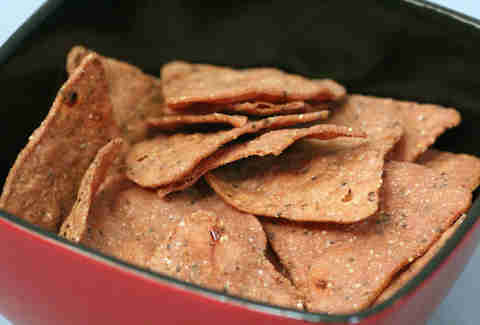 It’s as if Emeril was visiting the Doritos factory for a day and kicked a single batch up a notch. Overall: Spicy Nachos were not so spicy. Who knew? Average taste ranking: 4.2 - A light and airy texture combined with a cheesy potato base divided the group, with some loving the richness of the flavor and others being turned off by the grainy mouthfeel. Average spiciness ranking: 5.3 - These guys can do serious damage if eaten in large quantities super-fast. Overall: Awful comic strip, decent snack. Average taste ranking: 5.3 - Smoky, mesquite BBQ with an extra kick makes these potato chips a cut above in terms of flavor, which tasters described as being deeper and earthier than the other snacks. Average spiciness ranking: 5 - Not quite as spicy as they were tasty, these chips could benefit from a little added spice dust. Overall: The Luigi to Utz’s Mario. 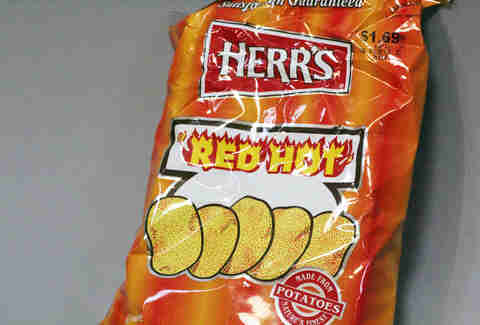 Average taste ranking: 5.3 - Pretty much the same as their sibling, Herr’s Red Hot, in terms of smoky flavor. 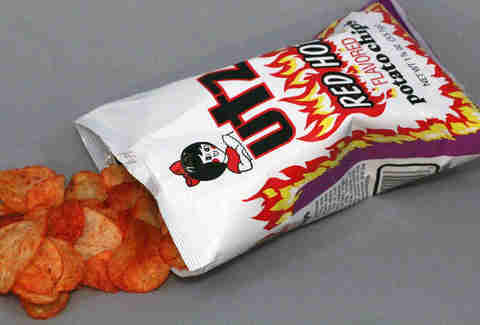 Average spiciness ranking: 6 - This is where Utz edges out Herr’s -- their chips are slightly spicier and make for a hotter eating experience. 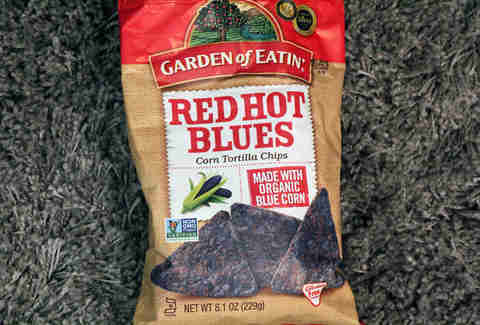 Overall: The standard-bearer of spicy potato chips. This is the one to beat. Average taste ranking: 6.3 - Tangy, spicy, and salty all rolled up into one convenient-to-eat package. 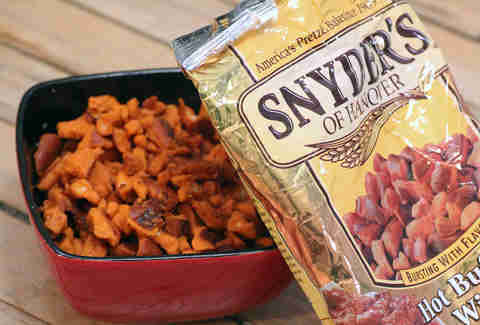 These taste like Buffalo wings condensed into pretzel form. Average spiciness ranking: 5.8 - Buffalo sauce has a reputation to be on the somewhat milder, butterier side of hot sauces, but in this case it’s one of the spiciest snacks in the running. Overall: Impressive Buffalo wing taste without having to visit BW3. 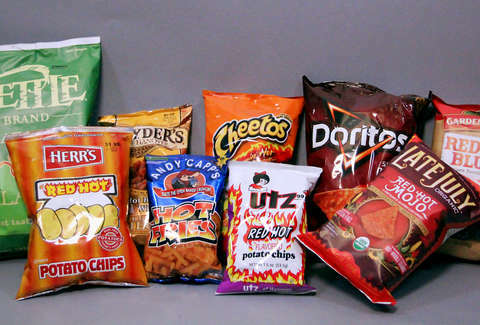 Average taste ranking: 7.8 - The undisputed lord of all spicy snacks, Flamin’ Hot Cheetos are a surge of salty, crunchy, red hot peppery spice that leaves your tongue feeling pins & needles. Disturbingly addictive. 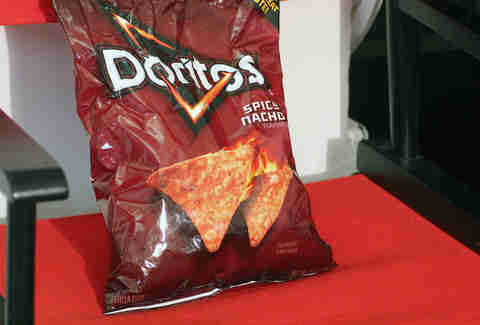 Average spiciness ranking: 8.7 - Easily the hottest of the bunch (one could even describe them as “flamin’ hot”). Not to mention the fact that the residue gets all over your hands and face and kinda makes you spicy by association. Overall: There’s a reason these are banned in some schools... and it might be for health reasons. Luckily, our adult bodies can handle a mouthful of cheese with that unmatched kick. 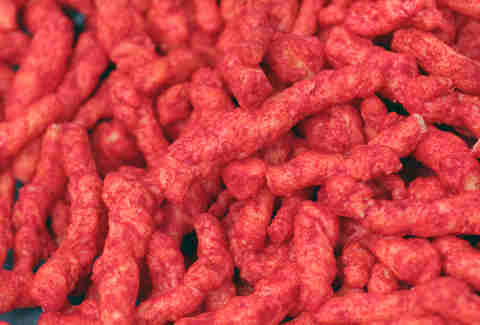 There is no better spicy snack on the planet.